Villas at Prospect Point are steps from Lake Dillon in Frisco CO Real Estate. 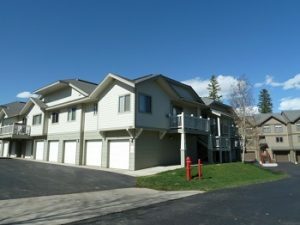 These Frisco Colorado condos can be found off of Dillon Dam Road on the Frisco side. Built in 1995 there are 90 condos in Villas at Prospect Point. There are 22 – one bedrooms each with 864 square feet some even have dens, 56 – two bedrooms with 982 to 1,123 square feet and there are 12 – two bedrooms plus loft with 1,420 square feet. Each Frisco CO condo in Villas at Prospect Point come with a 1-car garage. While there are not many amenities, which keeps the dues lower, there are on-site hot tubs at Villas at Prospect Point. At the entrance to the complex is a bus stop to take you to other towns in Summit County and between the condos and Lake Dillon is the Summit County Rec Path for biking, running and walking. Villas at Prospect Point in Frisco Real Estate are within town limits so there is a 1% transfer tax on the purchase price. These Frisco CO condos are ideal for those looking to own a property centrally located in Summit County Real Estate. For additional information about Villas at Prospect Point condos or other condos for sale in Frisco Colorado contact Justin and Krystal Knott with LIV Sotheby’s International Realty.